Smedley lived at 26 Prescott Avenue from 1896-1920. This delightful painting of a woman, a neighbor perhaps, is less formal than the large commissioned portraits that afforded the artist so much financial success. It was painted quickly in the Impressionist style. 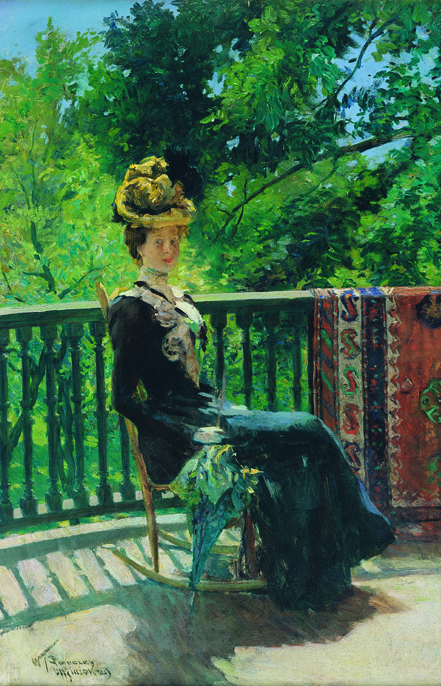 The young lady seems perfectly at ease as she poses on a balcony in the sunshine, her blue parasol at her side; the red patterned carpet hanging on the railing adds a vibrant contrast to the dappled green backdrop and the lady’s yellow hat.